JACKSON, MS – When helping thousands in need following two major hurricanes, it is vital to have the support of community organizations and local businesses inside and outside the impacted area. The Florida Division of The Salvation Army made a request to the ALM Division for a 53′ field kitchen which can provide up to 10,000 meals during disaster relief operations. 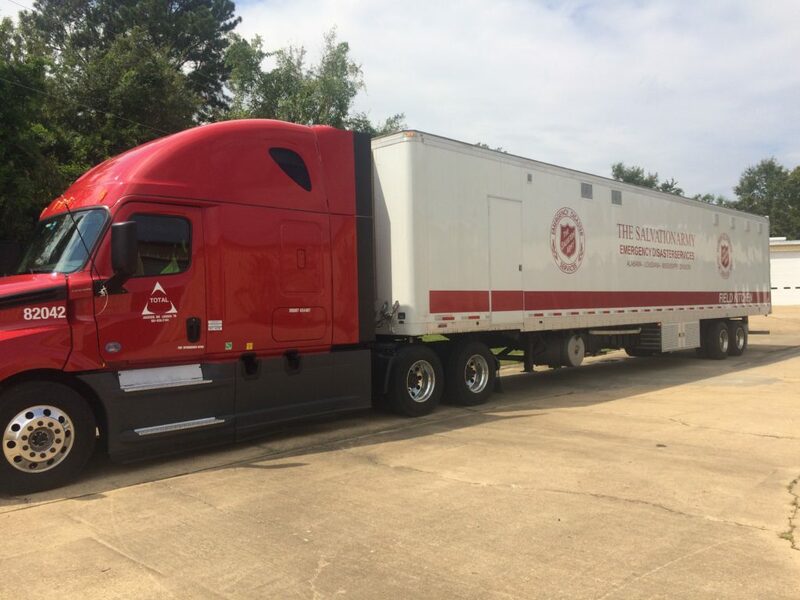 With so many Salvation Army assets deployed in Texas and Florida, the ALM Division found itself short on drivers and trucks to haul the needed resource. After a few phone calls, a local trucking company, Total Transportation, willingly filled the need. Total Transportation provided the driver and truck to haul the trailer. Stomps says The Salvation Army and Total Transportation play an important role in helping Florida’s recovery after Irma. “During times of disaster, the Salvation Army is a guiding light to many people’s lives and Total Transportation of MS along with the trucking industry will be there to ensure those needs are met,” said Stomps. Total’s driver delivering the field kitchen is Thomas Crysler who is a Florida native. Jon Kalahar is the Divisional Communications Director for the Alabama, Louisiana, Mississippi Division of The Salvation Army. For all media inquiries regarding The Salvation Army, please contact Jon at 601-961-7709 or reach him via email.